Six of the Green Schools Challenge and WE-LAB champion teachers and winners of the Dream in Green 2015 Innovation in Education Award were recognized on October 2, 2015 by the Returned Peace Corps Volunteers of South Florida, Miami-Dade County Teacher of the Year Coalition and the Armando Alejandre Jr. Memorial Foundation, for integrating service into the curriculum to improve learning, address community needs, and foster lifelong civic engagement among students. 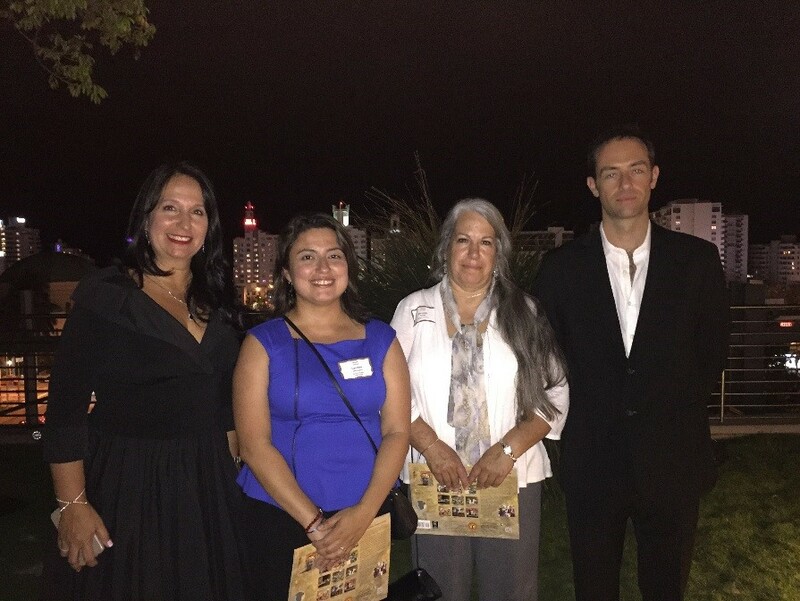 From left to right: Mrs. Ketty Quindemil (Marjory Stoneman Douglas Elementary) winner in the K-12 elementary category; Mrs. Carmen Marroquin (Hialeah Gardens High School) finalist in the K-12 category; Ms. Hannah Purcell (Air Base K-8 Center) finalist in the K-12 category; and Dr. Leopoldo Llinas (Palmer Trinity School) winner in the K-12 private school category. Ms. Nuris Binett of John I. Smith K-8 Center Middle (not pictured) won the K-12 middle school category. Ms. Carol Shill of Southwood Middle (not pictured) was a finalist of the K-12 category. “I am humbled and honored to have received this award,” said Dr. Leopoldo Llinas. “In the ‘Agents of Change’ class, I empower my students with the necessary experiences and skills to design, launch, and manage their own ventures for social change and environmental innovation. My hope is that together we can leave this world a little better than we found it. With the passion and dedication of my students I know we will,” expressed Dr. Llinas. It was no surprise to Dream in Green staff that our teacher champions were selected as finalists and winners of the ‘Spirit of Service-Learning Award’. They went above and beyond in implementing The Academy’s programs at their schools in 2014-15 and showed full commitment and dedication in educating students, and empowering and inspiring them to be part of the solution to environmental challenges. “All students are my inspiration and I know they are prepared to do their part to positively impact their families, their communities and their country,” said Ms. Binett, GSC teacher champion at John I. Smith Middle. These educators received the ‘Spirit of Service-Learning Award’ for inspiring a new generation of engaged, caring citizens committed to working for the common good. “The award selection committee members were truly in awe of the dedication, creativity, and impact of this year’s winners and finalists. We need to do everything we can to celebrate these outstanding educators and help more teachers infuse service-learning into their classrooms,” said Joshua Young, Director of the Institute for Civic Engagement and Democracy at Miami Dade College. “Dream in Green has done an exemplary job of promoting sustainability-related service-learning in Miami Dade County Public Schools and we are delighted to have them as a partner in this award,” concluded Young. The Peace Corps is comprised of Americans dedicated to bettering the world through service. For many of these volunteers, teachers who motivated them throughout their school years to serve and help others were an important aspect of their development as future Peace Corps leaders. Educators who foster a desire in their students to improve others’ lives selflessly are vital to creating the next generation of service workers.